Lathrop is home to its very own San Francisco-inspired candy land. Located right off i-5, Ghirardelli’s serves some of the sweetest treats San Joaquin offers, from Christmas-themed goodies to decadent ice cream sundaes. The extensive menu makes it easy to try something new on every trip—check out our picks for the top treats to try. Stock up on bags of this holiday staple! Peppermint bark is a Ghirardelli’s favorite, made with both white and milk chocolate and filled with crunchy candy cane pieces. Grab some for yourself, and spares for stocking stuffers. The ice cream shop at Ghirardelli’s Lathrop outlet is a big draw, reminiscent of the flagship store in San Francisco’s Fisherman’s Wharf. Every treat nods to a San Francisco landmark. Grab a Crissy Field Cookie Bits Sundae, a delicious blend of vanilla and cookies and cream ice cream, smothered in hot fudge, whipped cream, and chocolate chip cookie crumbles. Two milk chocolate caramel minis top it off. 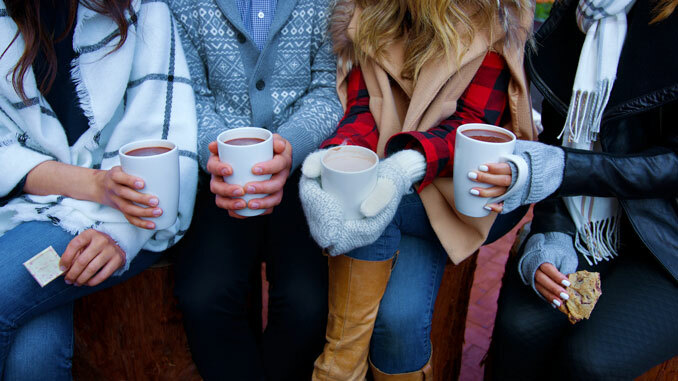 What’s better than a steaming cup of cocoa on a chilly December day? Not much! Ghirardelli’s blends a sea salt caramel variety topped with whipped cream, caramel sauce, and sea salt with a square of milk chocolate on the side. Craving something richer? The Decadent Drinking Chocolate is made from the brand’s mini dark chocolate chips. A dessert to feed the family—this favorite is made for four, featuring eight scoops of ice cream, eight toppings, a banana, diced almonds, mini dark chocolate chips, cherries, and whipped cream. There’s more to Ghirardelli’s than chocolate—no, seriously. Some of the best flavors are fruity in nature (although most still come with something chocolate). Trade in your traditional sundae for a Marina or Muir Woods. The first is made with raspberry sorbet and served with a dark chocolate square, the latter is black cherry vanilla ice cream topped with mini dark chocolate chips and a cherry.